We’ve proudly supported the Cpl. Joseph Pokorny Golf Outing held at Champion Lakes Golf Club in Ligonier each year. The outing is held in memory of Pokorny, a state police corporal killed in the line of duty in 2015. All proceeds benefit Make-A-Wish Greater Pennsylvania and West Virginia. Ligonier Township Police Lt. Eric Eslary was killed in a car crash with a drunk driver in 2015. We’re proud to help honor his memory by supporting the Lt. Eric Eslary Memorial Scholarship Golf Tournament. The proceeds of the event fund an annual scholarship awarded to a Ligonier High School student who displays the greatest community involvement and outreach. Edgar Snyder & Associates is also a sponsor of the annual Officers Down 5K. Officers Down—the largest national law enforcement company supporting law enforcement—partners with local nonprofits and police departments, which receive the proceeds from the year’s run. Our law firm is also a proud sponsor of the annual Allegheny County Camp Cadet “Cruise for Cadets” Motorcycle Run. Money raised helps support the Pennsylvania State Police Camp Cadet Program, which is a free, weeklong experience for children between the ages of 12 and 14 who are excited to learn more about law enforcement. 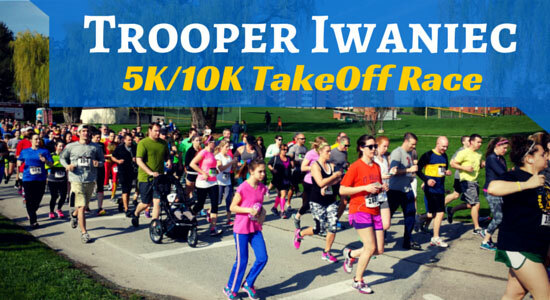 Each year, our law firm supports the Trooper Kenton Iwaniec Memorial Foundation through sponsoring, and participating in, the organization’s annual race. The event—which features 5K and 10K races as well as one- and five-mile fun walks—honors the memory of Iwaniec, who was killed in a car accident with a drunk driver. Money raised through the race is used to raise awareness of the seriousness of impaired driving. It is also used to purchase Preliminary Breath Test Devices to the Pennsylvania State Police and other local law enforcement agencies.